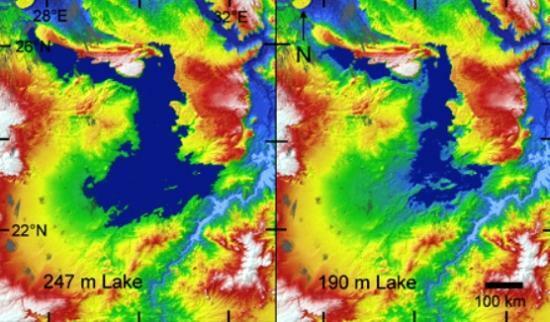 Radar images taken from the space shuttle confirm that a lake broader than Lake Erie once sprawled a few hundred kilometers west of the Nile, researchers report in the December issue of Geology. Since the lake first appeared around 250,000 years ago, it would have ballooned and shrunk until finally petering out around 80,000 years ago. Knowing where and when such oases existed could help archaeologists understand the environment Homo sapiens traveled while migrating out of Africa for the first time, says team leader Ted Maxwell, a geologist at the Smithsonian National Air and Space Museum in Washington, D.C. Modern humans arose in Africa about 200,000 years ago. “You realize that hey, this place was full of really large lakes when people were wandering into the rest of the world,” he says. Since then, desert winds have eroded and sands have buried much of the region’s landscape, says Maxine Kleindienst, an anthropologist at the University of Toronto. But during next summer’s field season, she and her colleagues will be checking for ancient shorelines at the elevations suggested in the new paper. Other studies have found evidence of mega-lakes in Chad, Libya and Sudan at various points over the past 250,000 years. The new study targeted Egypt, some 400 kilometers west of the Nile, where in the 1980s researchers reporting finding fish fossils in the desert. That discovery, says Maxwell, triggered scientists to think about how those fish could have gotten there. In 2000, astronauts on the space shuttle Endeavour used a radar instrument to take high-resolution pictures of the area’s topography. 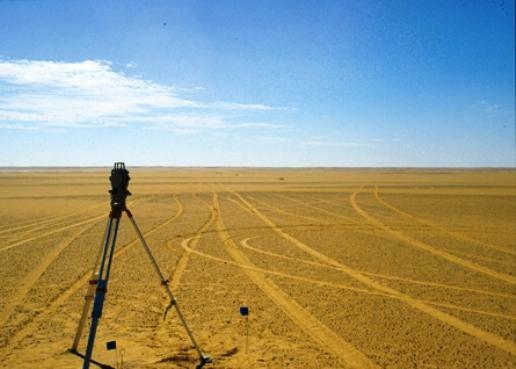 Maxwell and his colleagues recently analyzed those pictures to deduce how water would have drained across northeastern Africa over the past few hundred thousand years, ever since the Nile was born. In Egypt, west of the Nile Valley in a region known as Tushka, the researchers spotted a low-lying area where water would have pooled after overflowing from the river, carrying fish with it. At its maximum, this ancient lake would have stretched for 350 kilometers, down to the modern-day Sudan border. At the time, the Tushka area had more rainfall than today and would have been covered by grasslands, says Maxwell. Heavy rain in highlands to the south, from where the Nile flows, would have caused the lake to grow; dry spells shrank it. “This lake was going up and going down in size, doing all kinds of things over multiple thousands of years,” he says. Something similar is going on today at a smaller scale, says Mohamed Abdelsalam, a geologist at the Missouri University of Science and Technology in Rolla. Just northeast of where the huge paleolake once lay, the Nile also overflowed, starting in 1998. A series of five small “new lakes of the Sahara” was born. Deprived of water since 2003, these lakes have since almost entirely dried out, says Abdelsalam. Today, for water, Egyptians rely almost exclusively on the Nile and its annual floods. The ancient lakes, says Maxwell, suggest that such flooding was already under way, at least to some degree, a quarter million years ago.